I assure you, Lord Vader. My men are working as fast as they can. 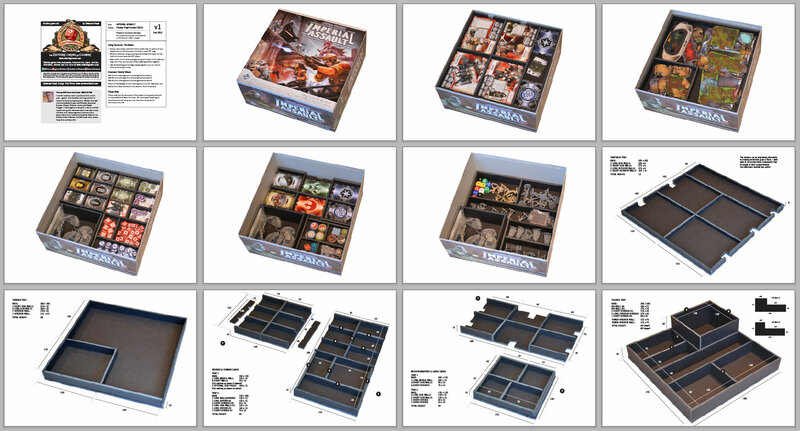 Our first guest contributor is David Acton, who has created foamcore box insert plans for Star Wars: Imperial Assault! I love the outdoors, travel, my kids and wife, and oh yeah… games! As a Canadian with long winters I’m lucky to have plenty of gaming time. Games I love right now (and probably always) are El Grande, Ascending Empires, Ninjato, Robinson Crusoe and Twilight Struggle. I like my games to be quick to set up and find myself making more foamcore inserts these days to help with that, and I always appreciate foamcore plans, player aids and rule summaries shared by others on the Esoteric Order of Gamers, and BGG (user name: davea). Keep Calm and Game On! It’s an exciting day here at the EOG, as we welcome our first guest contributor. David Acton has created a stunning bit of foamcore box insert design for Star Wars: Imperial Assault, and I’m proud to have it join the archives of the Esoteric Order of Gamers. I’ve gone back and forth on the subject of soliciting contributions to the EOG; on one hand, I would love to share some of the workload and expand upon the range of fun stuff available here, and on the other, I’m a relentless perfectionist who wants everything on this site to be of as high quality as possible. So it’s a demanding job being an EOG contributor, the least requirement of which is to be able to put up with extended pestering from yours truly! David rose beautifully to the challenge however, and enthusiastically joined with me in adapting his plans to the EOG format: taking photos, supplying a plan, and checking and re-checking this file in order to make it the best it can be. Unfortunately, I don’t yet own Star Wars: Imperial Assault, so I haven’t yet built this insert. But I’m sure David would be interested in your feedback and comments. Let’s make him welcome, and thank him for this wonderful contribution to the EOG archives! Update: v1.1 makes some small fixes to the bottom figures tray. Excellent!! I have been waiting for these plans to show up here since I bought the game in December 2014! Major thanks goes to David for his contribution to the Order of Gamers! I don’t own the game but gave the insert plan a look anyway and it was worth it! It looks fantastic! I am always amazed to see ingenious people design an insert to efficiently store these huge amounts of game components inside the restrictive box the game comes in. I did build the Descent 2 insert based on the plan that can be found here on the Order of Gamers and thought it was really complex already, but it’s complexity pales compared to this insert! Big kudos to David! Indeed, he did a great job! A few people are worried about the minis moving around; cut some foam core dividers and friction fit them in the larger compartments – this holds the minis secure and is changeable if needed. You know I often find that as long as your painted plastic minis are protected with a varnish, it doesn’t matter if they are just thrown into a compartment together. They don’t really have the mass to damage each other. I wouldn’t do it with metal minis but with plastic it doesn’t seem to be an issue. Is there room for the General Weiss AT-ST villain pack? Looked like there might be but could be a little tight. I think David has, understandably, just designed this for the core game. Since figure expansions will no doubt come thick and fast, there’s no way to allow for them all. There is extra space in the figures tray, but I didn’t have any of the expansions when I designed it so can’t guarantee what will fit. Sorry Bradley but I don’t have the General Weiss pack so can’t check for you, maybe somebody else has tried? I have every figure expansion for the core game in the box with these plans. It does take a little finagling to get both atsts and the nexus in the big section, but they can fit, and you might even have room elsewhere for one of the nexus. I am really hoping for insert plans for the twin shadows expansion and figures though, because there’s definitely no room for them. Hmm, I checked, and both C dividers appear to be 125mm long as listed. Anyway, thanks for the diagrams!! You rock!! Thanks ggarfer – You are correct; The divider beside the AT-ST storage is 130 mm long in my build. Sorry for missing that in the final editing. Thanks for making that so clear ggarfer – I’ll update the sheets asap! Fix made. I changed things a bit so the two areas line up – see the file. Here is the result! Thanks again for the instructions!!! Brand new around here but I want to pop in and say these plans are really great. I started working on them on the weekend and its coming along really well. I also wanted to point out a small flaw on page 11 that I realised after building it to the listed measurements. The plans for tray 2 are 5ml too short, the base should be 140ml x 130ml and the three short side walls should be 130ml x 15ml. I managed to modify my tray afterward and it still looks good, but I thought I’d share . Hi Nimos – thanks for noticing – no I know somebody reads the plans! I made those trays intentionally smaller in my build in order for ease of fit and removal (as ggarfer commented also). I don’t see a problem there as the 5 mm shorter make it easier to grab the tray. Yes. In general it’s really not practical to design foamcore inserts for those who sleeve their cards as they then take up so much more room. I just want to say thanks for making and posting these. I made them for a friend when I saw the horrific insert (typical Fantasy Flight). After preparing the insert for him, we had to play and the campaign tray is a godsend. The whole thing is just amazing! Just made this , thanks! Works very well. The tutorial videos are great too. I ended up making these per your plans and they are great! First time doing this for a game and I enjoyed the little project! Thanks!!! Is there a way to get sizes but with the sleeves ? I would hate to fall short at the end of the build. As mentioned above, this is not designed or tested for use with sleeved cards.